After such a brilliant win against Tottenham to stop their title race and 3 clean sheets in a row, we got humiliated by Liverpool in our last game at the London Stadium this season. Looking to finish the season on a high, we travel to a Burnley team that have been fantastic at home this season. 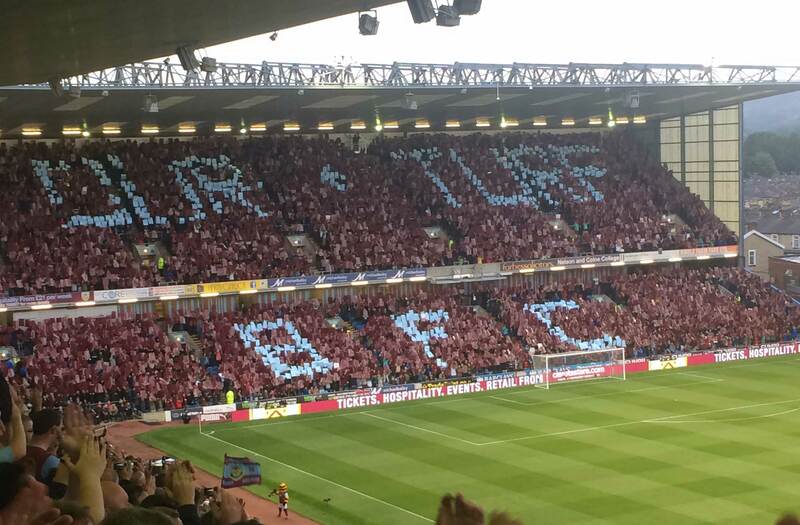 Burnley have been playing at Turf Moor since 1883! The stadium was redeveloped in the 90’s, the first of their new stands (The James Hargreaves Stand) was opened in 1996. Two of their stands were opened in 1969 and 1974 respectively, giving the stadium half modern/half classic look and feel to it. The away stand is shared with home fans and has good acoustics, meaning you can create a good atmosphere at the game (which, as West Ham fans, you will no doubt do). There are two railway stations that are within walking distance of the stadium: Burnley Central and Burnley Manchester Road. Central station is approximately 20 minutes and is served by local train services, whereas Manchester Road is a 15 minute walk and is served by faster services from Manchester Victoria. To get to Central station, you will have to get a train from London Euston to Preston (Lancs) then a direct train to Burnley Central. To get to Manchester Road, you will have to get a train from Kings Cross to Leeds then to Burnley Manchester Road from there. Both journeys will take approximately 4-5 hours. Burnley Manchester Road: When leaving the station cross the road towards the cinema, the ground is visible from here straight ahead. Turn left and go down the A682 ‘Centenary Way’ downhill. After a few minutes you will come to a roundabout, turn right under the canal bridge onto the A671 (Yorkshire Street). Go down this road and Turf Moor will be on your left and the away stand will be the first one you come to. Burnley Central: When coming out of the station you will see a small retail area, head towards that and you will reach the inner ring road A679. Turn left and after 200 yards you will come to some traffic lights, turn right at the lights onto the A682 (Church Street). Walk down this road until you reach a large roundabout. Turn left onto Yorkshire Street (the same one mentioned in the Burnley Manchester Road). Continue down this road and Turf Moor will be on your left with the away stand the first one you come to. In your sat nav, put in the post code BB10 4BX to take you to Turf Moor. Leave the M6 at J29 onto the M65. Leave that at J10 and follow signs to Towneley Hall. This road will go past the ground. There is a Cricket Ground near Turf Moor which offers parking for £6, a private car park on Doris Street (BB11 3DL which xosts approximately £5 and is 400 yards from the stadium. Other than that it’s only street parking available. Be careful and check for any permit parking and always make sure you park legally to avoid tickets and fines. Inside the ground it’s quite cramped, but you are able to get hot dogs (£2.70) and pies (£3). Alcohol is available in the form of lager (£3.50), bitter (£3.20) and cider (£3.50). Near the stadium is the Cricket Club where you can park. It’s open on match days and away fans are welcome – even wearing colours. There’s also a pub nearby called the Queen Victoria Public House, where you can park for £5 and get refunded against the cost of food and drink. The Queen Victoria is approximately a 10 minute walk away from the stadium. Another pub is the Bridge Bier Huise, again approximately 10 minutes away from the ground. It serves beer that’s listed in the CAMRA Good Beer Guide and offers bottled beers from around the world. You can visit their website for any information. The Talbot pub has a large screen TV and home fans, plus real ale on tap. The Turf Hotel on Yorkshire Street and pubs in the town centre are best to avoid, and don’t show colours in and around the town centre.